Are stocks 'in a big, fat, ugly bubble,' as Trump claims? Donald Trump thinks that the market is "in a big, fat, ugly bubble." Is he right? It is true that stocks have been rallying hard -- with a couple of brief pullbacks here and there -- since March 2009. The S&P 500 has more than tripled in the past seven-and-a-half years. The economy has really been so-so. Earnings have been declining for the past few quarters. And there are now worries that stocks could be running out of steam. The market has pulled back a bit from recent all-time highs. So is it really the case that, as Trump claimed in Monday night's presidential debate, Wall Street is ignoring many risks and "the only thing that looks good is the stock market?" Several investing experts disagreed with that. And the market was up slightly Tuesday morning despite Trump's alarmist call. "Bubble is a harsh word," said Sean O'Hara, president of Pacer ETF Distributors. "I don't think the claims of a bubble are valid and I hope that most investors don't," added Albert Brenner, director of asset allocation strategy at People's United Wealth Management. Why is this probably not a bubble? For one, stock prices -- while expensive -- aren't absurdly so. The overall market is valued at about 16 times 2017 earnings estimates. That's not cheap, but it may be reasonable, given that analysts are expecting profits to increase more than 13% next year and another 10% in 2018. Remember that investors tend to look ahead, and not dwell on the present or past like politicians often do. Leading tech stocks like Apple (AAPL), Google owner Alphabet (GOOGL), Microsoft (MSFT) and Facebook (FB) are profitable and trading at reasonable valuations. The only major tech stock that might be considered bubblicious is Amazon (AMZN). So Trump's claims that the market is overvalued don't seem to ring true. Brenner agreed that there are big sectors in the U.S. economy that are hurting -- especially energy, in light of low oil prices. But Trump -- and investors -- can't ignore how well tech and many consumer companies are doing. The economy has shifted away from manufacturing and more to services. "Energy is having a big impact on earnings and there is this secondary effect. There is a perception that the economy is like molasses. It's in this slow grind. But I'm not sure that's entirely accurate," Brenner said. "Earnings are not as bad as you think." But O'Hara thinks Trump is correct to note that companies need to do a better job of hiring and boosting their sales though instead of just taking advantage of low rates to pretty up their balance sheets and prop up earnings. O'Hara said people should be worried about companies using stock buybacks and dividends to attract investors instead of investing in growth. "We are pretty good at manufacturing earnings today even if we might not manufacture a lot of other stuff anymore," O'Hara said. Still, the lack of a major market move on Tuesday may be a sign that the race remains too close to call. 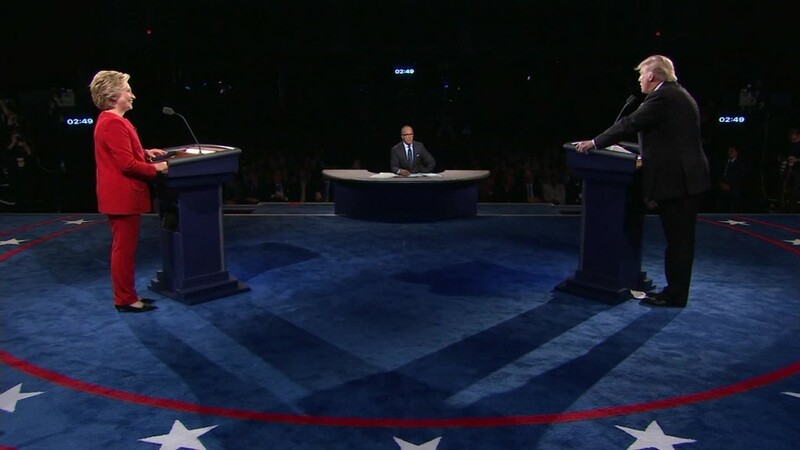 After all, there are two debates to go -- and six more weeks until Election Day. So you can add a heavy sigh of exasperation to all those shrugs. "This debate was great theater, but I'd be surprised if people will place trades based on it," said TD Ameritrade chief market strategist JJ Kinahan.